Image caption George Fawkes with his favourite of the newly-donated toys - the lost kangaroo's "cousin from Australia"
A boy with a rare form of dwarfism has been sent a number of soft animal toys by wellwishers after losing one he always took on regular hospital visits. George Fawkes has received about 20 kangaroos, wallabies and koalas since losing his cuddly "Kangaroo". 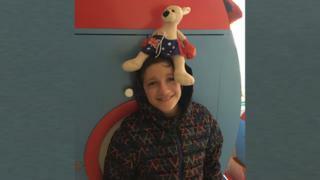 The 10-year-old's mother Gilda contacted the BBC last month to help find the toy, which had accompanied George through years of surgery. Mrs Fawkes, of King's Lynn, said the response had been "unbelievable". George, who has Floating-Harbor Syndrome, requires regular surgery and always took Kangaroo with him. He lost his cuddly friend on a train as he travelled from Norfolk to Bristol Children's Hospital on 16 November. Mrs Fawkes said she was contacted by the hospital, whose reception was "full of parcels" for him, including a toy platypus from Taronga Zoo in Sydney. "They had all been anonymously sent with lovely notes attached," she said. The original Kangaroo is still missing but George has since picked out a toy "very similar to his friend". "We explained he was a cousin from Australia," Mrs Fawkes said. "George still asks where Kangaroo is, but we have told him he found someone who needed a friend and now he seems a bit happier." George, who did not want to have any more operations without Kangaroo, has now got his surgery schedule back on track. He even made a festive visit to the children's hospital to donate gifts to patients on Penguin Ward, where he has often stayed. Mrs Fawkes said a special thanks needed to go to "Chris from the GWR lost property team and Martin, the children' disability officer at the hospital, who tweeted the 'Where are you, Kangaroo?' appeal". She also said she had been contacted by two families who saw the original BBC article and have the same rare condition as George.